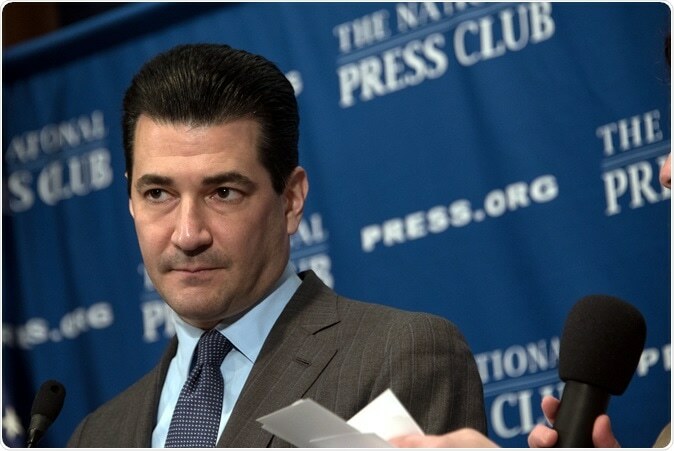 Scott Gottlieb, the commissioner of the United States Food and Drug Administration (FDA) has announced that he would resign from office at the end of this month. He has been one of the strongest advocates on regulation of tobacco and e-cigarette industries in the recent past. His reason for quitting is personal wherein he cites his long commute home to his wife and three children – 9 year old twin daughters and a 5 year older daughter, living in Westport, Connecticut. There have been speculations about his aggressive views in regulating e-cigarettes for teenage use and the rising epidemic of teen vaping. The 46 year old cancer survivor, Dr. Gottleib, was pushing for lowering nicotine levels in e-cigarettes and removal of flavours that could attract middle schoolers and teenagers to start vaping. Recently he has been under pressure from some Republicans in Congress and some previous associates who stopped Gottleib from implementing some of the FDA regulations to prevent teen vaping. The FDA under Dr. Gottleib’s administration has approved a large number of new drugs, medical devices and generic medicines. He spoke for lower drug prices, price regulation and also worked to prevent and reverse the opioid crisis.